I’ve had questions from a number of readers recently asking about the different rates and ranks in Kydd’s day, so herewith a ready reference. In the Georgian Navy the main division was between officer and seaman. There were very few who crossed the boundary (as Kydd did) between them. 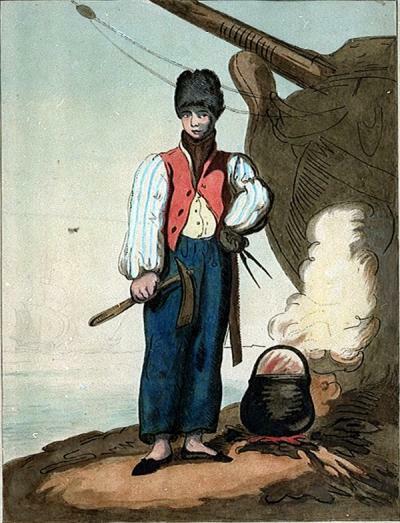 A sailor is anyone who goes to sea, including cooks etc. A seaman is one with the calling and gifts to be respected as one. 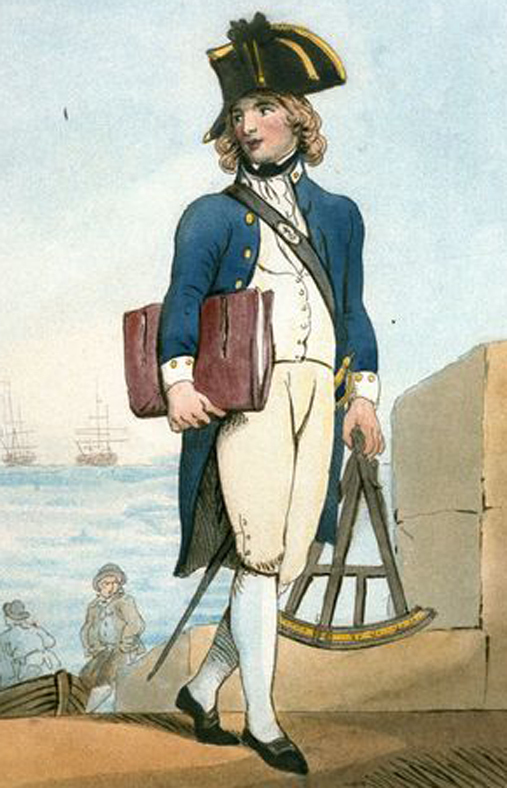 A mariner is a deep‑dyed seaman. These terms may be applied to an officer, but not ‘Jack Tar’ which is for the men, as is a foremast hand/jack, old salt, tar, bluejacket. The main divisions for Jack Tar are that of landman/seaman and seaman/petty officer. Their rating was awarded by the captain of the ship as a local title; they could be rated up or disrated by that captain. Ships boy: usually ten years old or more. Landman: a seaman without skills. He was not allowed up in the rigging and assigned menial tasks like scrubbing the deck. Ordinary seaman: He had elementary sea skills. Able seaman: This was a fully skilled sailor who could ‘hand, reef and steer’. Petty officer: He held a position of authority in the ship, ranging from captain of the top (in charge of men in the rigging doing the reefing etc.) to quartermaster’s mate (understudy to the seaman in charge of the helm). Warrant officer: This was a professional head of a department – boatswain, gunner, for example. A warrant officer held a warrant by examination. A petty officer could be promoted to master’s mate, tasked to assist the master in navigation etc. He could be relied on to take over a prize vessel, lead a landing party and other skilled tasks. A midshipman could also be promoted to master’s mate – one of the senior Reefers perhaps passed for lieutenant but not yet with a commission. The cook held a warrant like a warrant officer, and was generally a seaman who had been crippled in action, but often knew only how to boil salt pork (the officers had their own cook/s). Officers were those who held the King’s commission. Lieutenant – first, second, third etc. in accordance with experience and record. It was necessary to pass an examination for this rank, which was an appointment to a particular ship. Lieutenant-in-Command: a lieutenant in command of a small unrated vessel; he was accorded the honorary title of captain. Captain: When ‘made post’ to a post captain (after several years’ seniority gained), he could command anything that floated. Commodore: A captain put in charge of other captains/ships for a specific purpose such as a descent on an enemy island. After the objective was achieved he reverted back. Admiral: One permanently in charge of a fleet, or part of a fleet. A commander‑in‑chief: in overall command of more than one fleet and often other military resources as well. What was life aboard ship like for cabin boys? Did they assist the officers’ servants only or did they help in other ways throughout the ship. Did they do double duty as powder monkey’s, for example? Where were they berthed, aft or forward? Did they have their own private space (not individual space, but an area for all the cabin boys)? How did they end up in the navy, pressed or perhaps put aboard by parents who couldn’t afford them? What was the average age of a cabin boy? What was his future like? Would he eventually become an officer’s servant, for example? No question this time, but wanted to say that I’m reading COMMAND now, and just finished the passage with Commander Kydd delivering dispatches to Admiral Sir John Warren. I loved the exchange. Warren is so gruff and funny. I was just cracking up. But as he said to Kydd, he’s lucky Warren didn’t take him under his command. By the way, were you ever aboard the Bounty, the ship used in the 1962 version of MUTINY ON THE BOUNTY? I was aboard twice, the first time in NYC in 1964 when she still had her same coloring and about a year before she sank at the tall ships display at Navy Pier in Chicago. So sorry she sank. A beautiful ship. If an Admiral gave orders to fire upon a ship he suspected of being a privateer, but was in fact a passenger vessel, what repercussions would there be? What if the Admiral sunk the passenger ship? Most likely a court martial! How many cases are recorded where a British Admiral was subjected to a military court except in home waters? In the estuary of the Plate. I am familiar with modern dredging having lived in the Fens, and now on the coast of The Wash where, as you will know, there are shifting shoals. What was a dredging vessel like two centuries ago, please? As it happens I recently saw a fascinating model of an early (human-powered…) dredger in a museum in Copenhagen. You can see a photograph of it in a recent blog I posted. a question I have asked before. In modern ships the First Lieutenant is referred to as the ‘Jimmy’ or ‘Jimmy the one’ Why is is this and when was the practice first begun ? The first lieutenant is also called ‘Number One’ and in the days of sail ‘jeminy’ referred to neatness and cleanliness aboard ship. I’ve heard that Jimmy the One comes from these two things – The first lieutenant became Jeminy the First as he was responsible for this aspect under the captain, and from that came – Jeminy the One, then Jimmy the One. Reefer = one who reefs (reducing the effective amount of a sail by gathering in a certain amount of it) a sail. As midshipmen were stationed in tops during reefing they came to be known by this nickname. Hi Julian, Question on the Ships Boys–I know sons of officers often went to sea as boys. Did they mix with the other ships boys? Was there a hierarchy there? When I took a tour of the Victory, one of the guides said the Gunner’s Mate usually oversaw the boys. Was that the officer’s sons, as well? Thanks! I’ll answer this in a future blog, Ellen. Thanks for the question. Once a lieutenant or commander achieved the step to captain, can you describe his path forward? Was there a distinction between a mere captain (by which I mean the bottom name on the captains’ list, not a captain by courtesy) and a post captain entitled to command a post ship? If so, was the posting of a captain discretionary, or was it automatic, like the transfer of the swab from one shoulder to the other after three years? And am I correct that the progress of a post captain up the list and onto the admirals’ list was automatic, based solely on seniority, with a captain advancing into the nine flavors of admiral (blue, white, and red; rear, vice, and full admiral) simply as a result of the death of his seniors? I’ve read many references to a captain’s promotion to the rank of rear admiral as being a great honor, but was it actually anything more than recognition that he was still alive, regardless of merit? Similarly, was jealousy about very young admirals (like Nelson) based on any factor other than their having had the luck and influence to be promoted captain at a very young age? The difference between commander and captain was based on the size of the ship (number of guns etc.) he was entitled to command. Only a post captain could command a frigate and above. You earned ‘post’ on merit; the judgement and gift of the Admiralty. The epaulette of a new captain did shift from one shoulder to both after three years’ seniority, as you say but this was automatic as was his eventual (after many years) promotion to Admiral. Young admirals sometimes got their position by senior captains ahead of them being promoted early – lucky them! Also, a distinction has to be made – you might be promoted admiral but you don’t necessarily get put in charge of a fleet of ships. You could be essentially unemployed and ashore. These were called ‘yellow admirals’. And all officers from lieutenants to admirals may have served in a position aboard a ship, losing it by shipwreck, ship being taken out of service etc. then find themselves without employment, sometimes for years. And there was always many more officers than there were sea-going billets to fill (even in war). To what level could you buy a commission? For example, if you were wealthy enough could you buy a commission as Captain (as it seems you could do in the infantry)? Also, if you came from a trades family that found sudden wealth, could you buy a commission without being part of the gentry? You could never buy a commission in the Royal Navy. All posts and appointments were on merit. Just like today, influence and ‘interest’ could help advancement, but never secure the original commission as officer.